Drs. 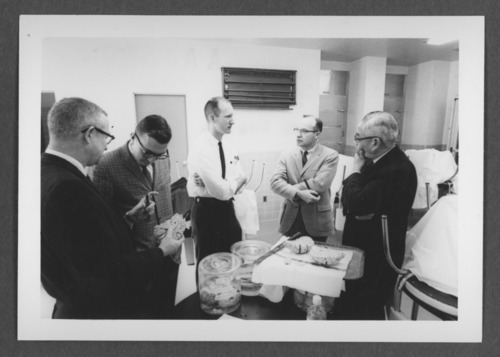 Robert Woods, Fred Peisner, Doug Sheafor, Claude Barnhill and Leslie Cheng are conferring around specimens of human brains at the Menninger School of Psychiatry in Topeka, Kansas. The Menninger Clinic philosophy of treatment was based on psychoanalytic theories. It was known for its bio-psycho-social approach. This philosophy of treatment integrated medical, psychodynamic, developmental, and family systems to treat the total health of patients. It was located in Topeka, Kansas, from 1925 to 2003 and is now in Houston, Texas.